Shas chairman Aryeh Deri spoke on this evening at the Shas party’s victory rally in Ma’ale Hachamisha and dissected the party’s electoral achievement. 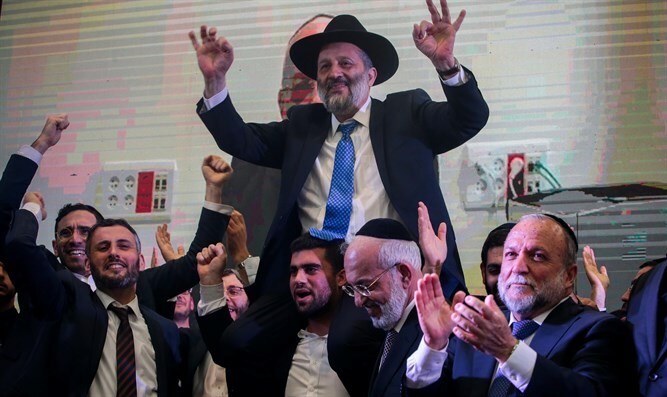 “Shas is the third largest party, period; how we had to convince people we could pass the electoral threshold, how we had to convince everyone that the surveys don’t know how to survey Shas,” Deri said. “I was sure that after the strong results in the local elections, the pollsters would think again about the strength of Shas,” he said. “I hope that now, after the amazing result, the pollsters and commentators will think again, who would have believed that Shas with thousands of surplus votes would supply UTJ’s eighth mandate? Defense Minister Moshe Ya’alon said Saturday that Israel had no partner for peace in the Palestinian Authority (PA).